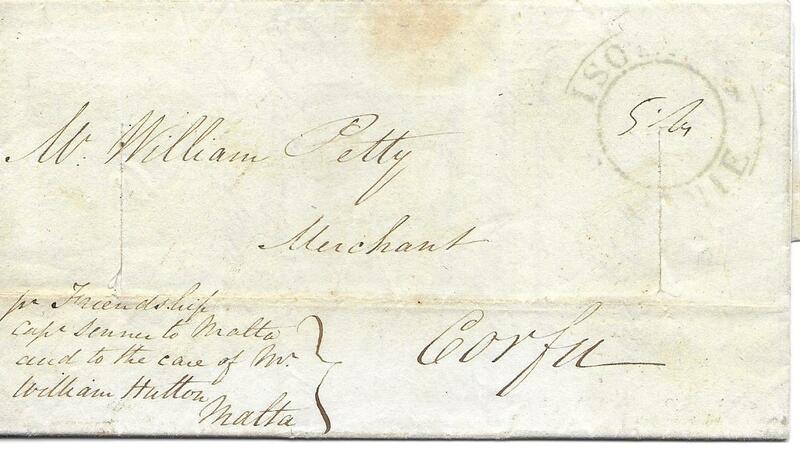 1822 entire to Corfu endorsed at bottom left to travel privately to Malta and to be passed to care of forwarding agents "William Hutton". 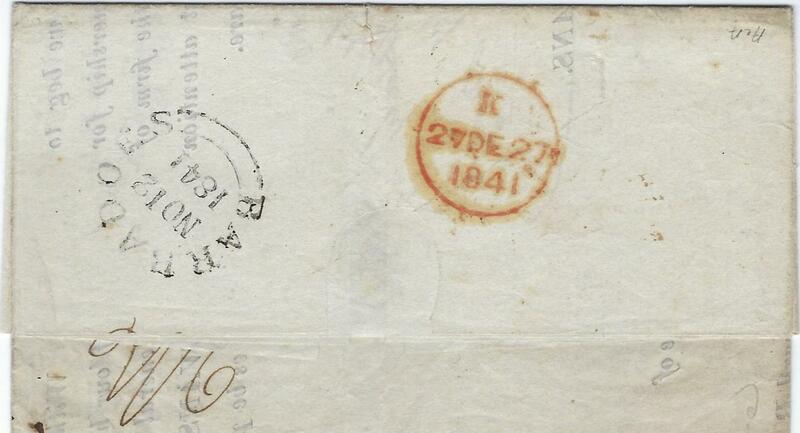 The reverse bearing straight-line 'April 24: T-2,10' charge handstamp applied in Malta, front bearing Ionian Islands arrival handstamp. 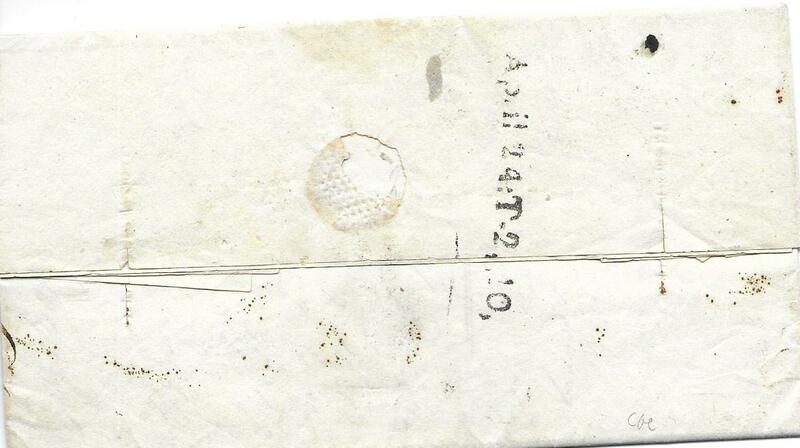 The entire is disinfected with two vertical slits. 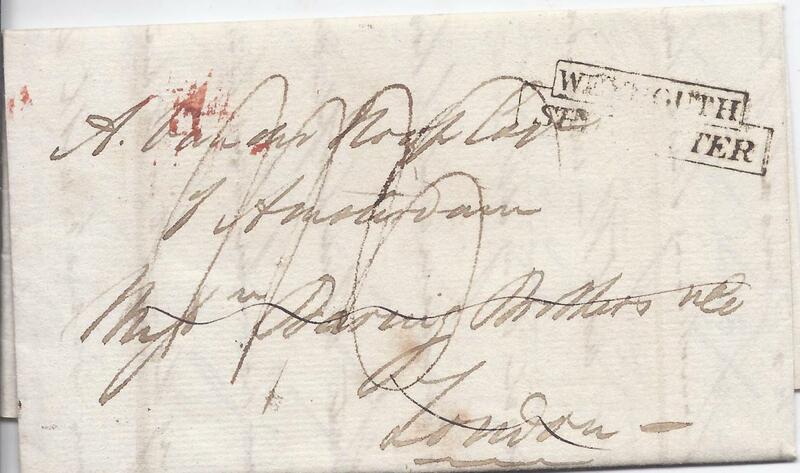 1826 entire addressed to Amsterdam bearing manuscript rate markings and stepped Weymouth Ship Letter handstamp, forwarded through London by "Baring Brothers". 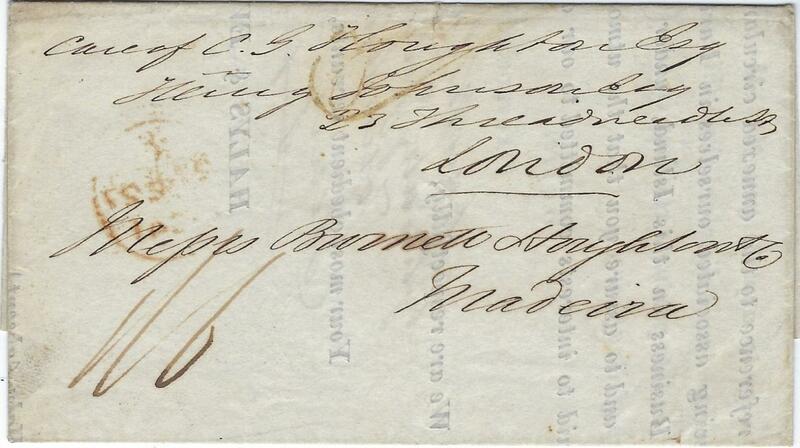 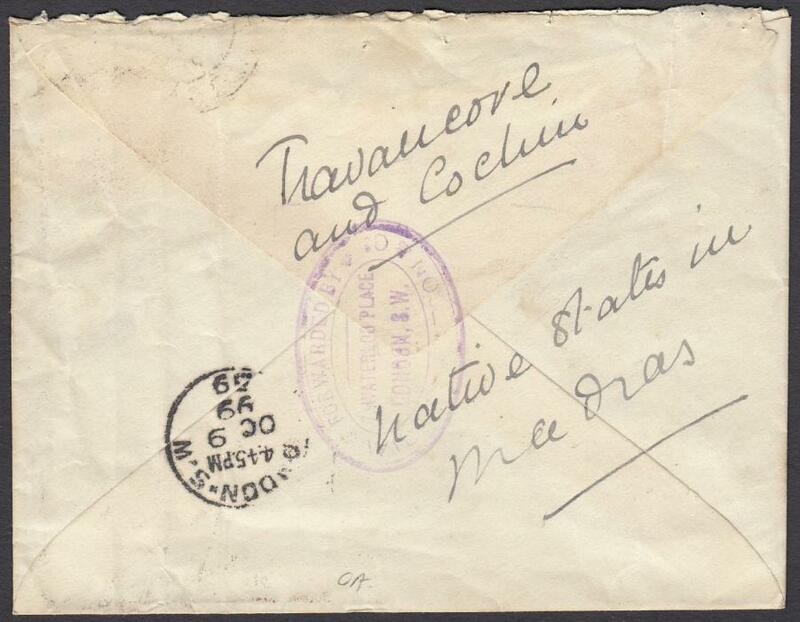 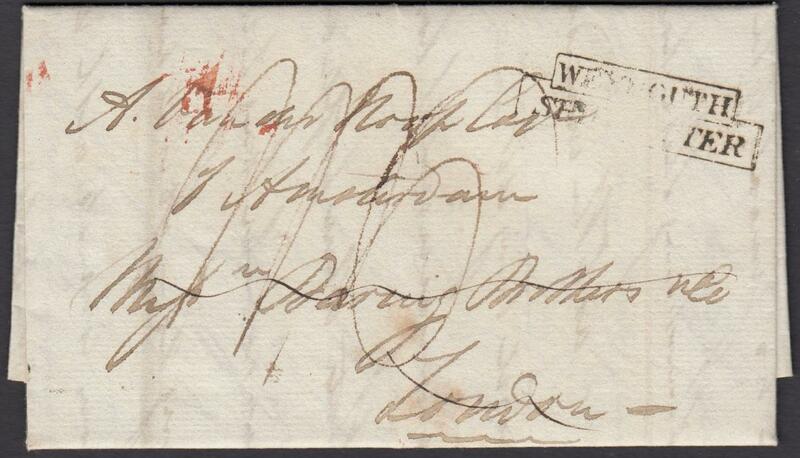 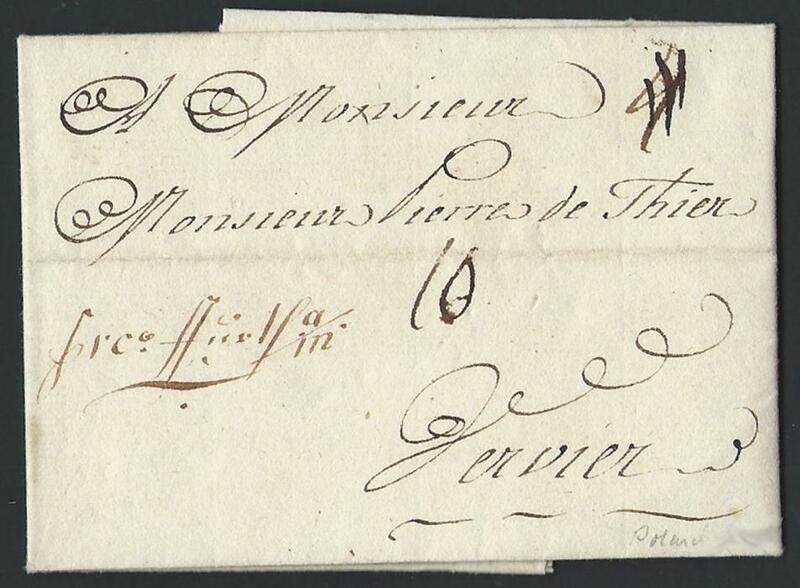 The reverse of entire suggests that the entire was forwarded from Amsterdam to Batavia,Netherland Indies. 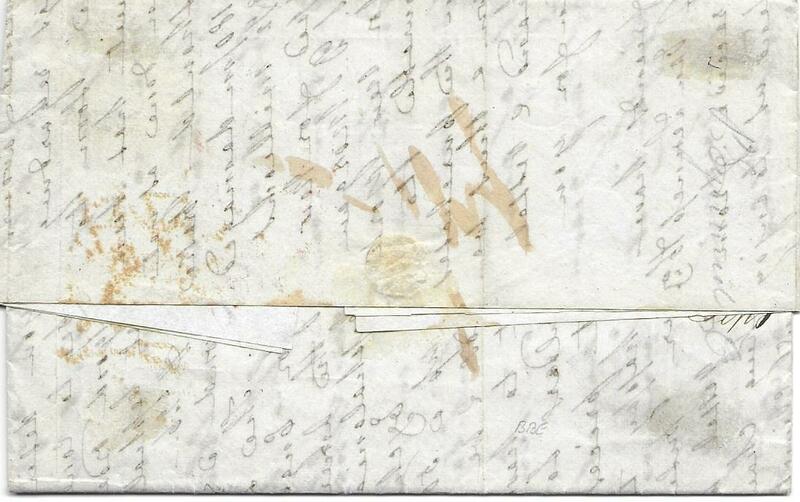 1826 entire to Amsterdam bearing manuscript rate markings and stepped 'WEYMOUTH/SHIP LETTER' handstamp, forwarded through London by "Baring Brothers". 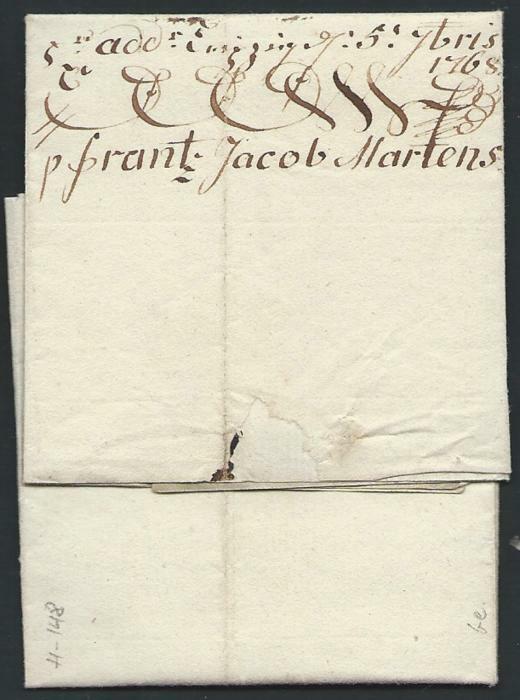 The reverse of entire suggests that the entire was forwarded from Amsterdam to Batavia, Netherlands Indies. 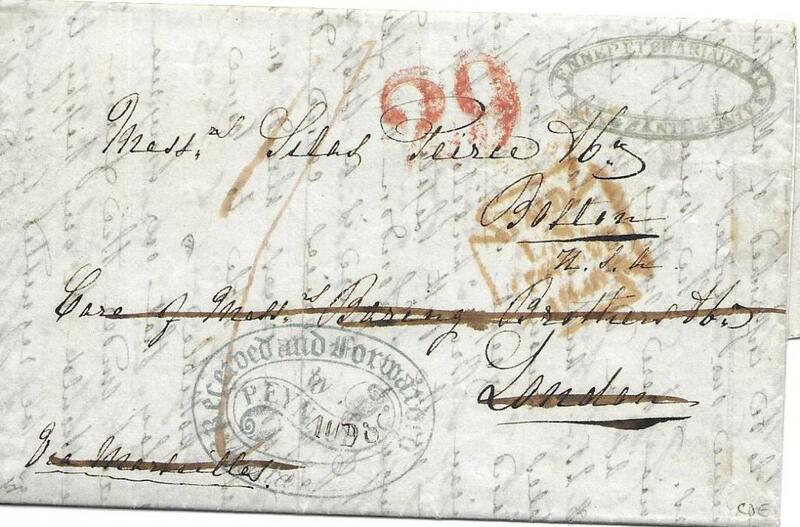 1841 part printed entire to Madeira, annotated "care of C.G.Houghton Esq, London", struck on the reverse with the large double arc Barbadoes cds and London arrival, front bearing a manuscript "1/6" rate and the reverse a "2/6" rate for the forwarding to Madeira which had to be prepaid. 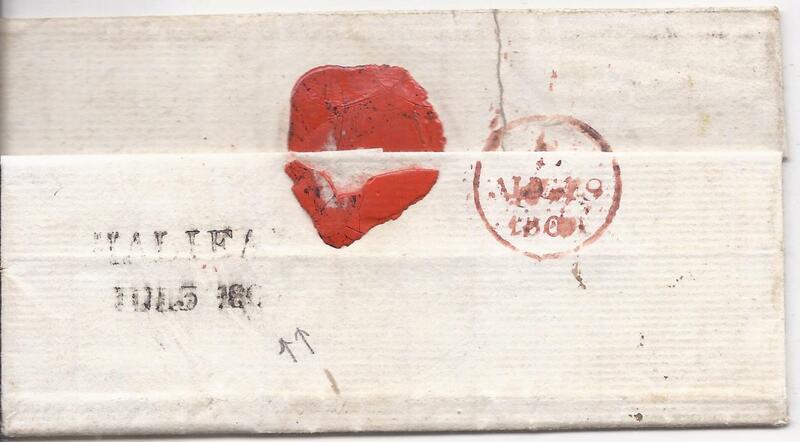 1848 entire from Zante to Boston, United States endorsed �Via Marseilles� without any clear indication of despatch except for commercial chop top right, addressed care of forwarding agents in London whose blue ornate handstamp appears at base, red PAID date stamp of London and red �29� US accountancy. 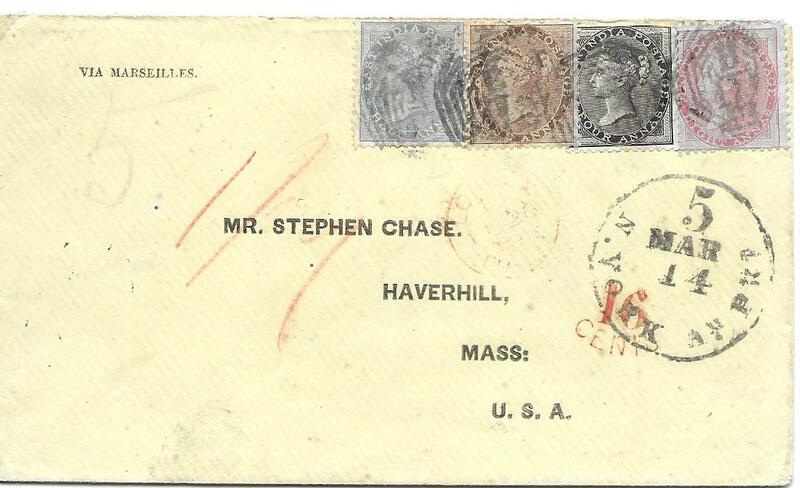 1859 cover to �Passenger Overland/ Post Office. 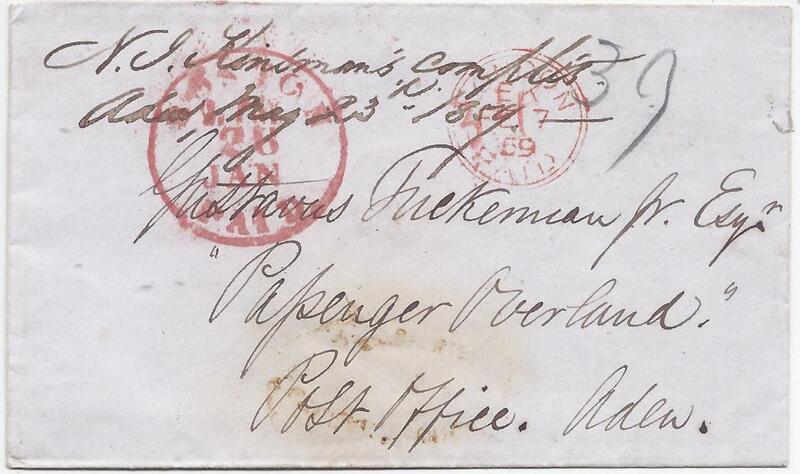 Aden�, red Boston Paid cds, carried by British Packet at 39c rate on cunard �Niagura�. 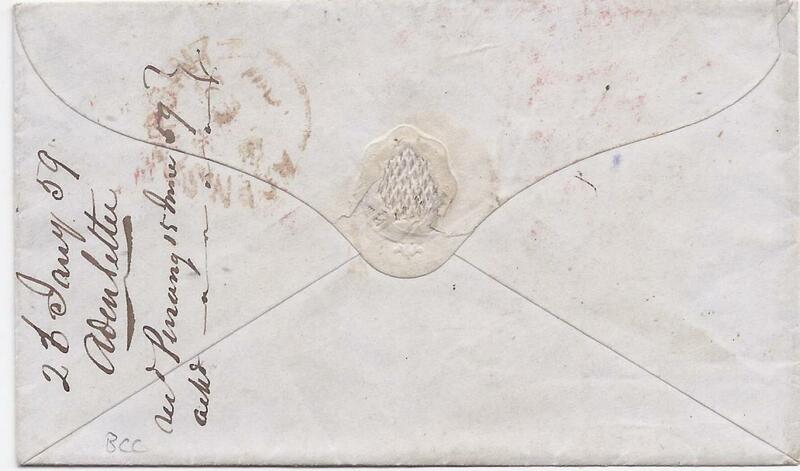 At top manuscript endorsement �N J Kindman�s complis/ Aden May 23rd 1859� for forwarding out of mails to Penang, a manuscript arrival endorsement on reverse. 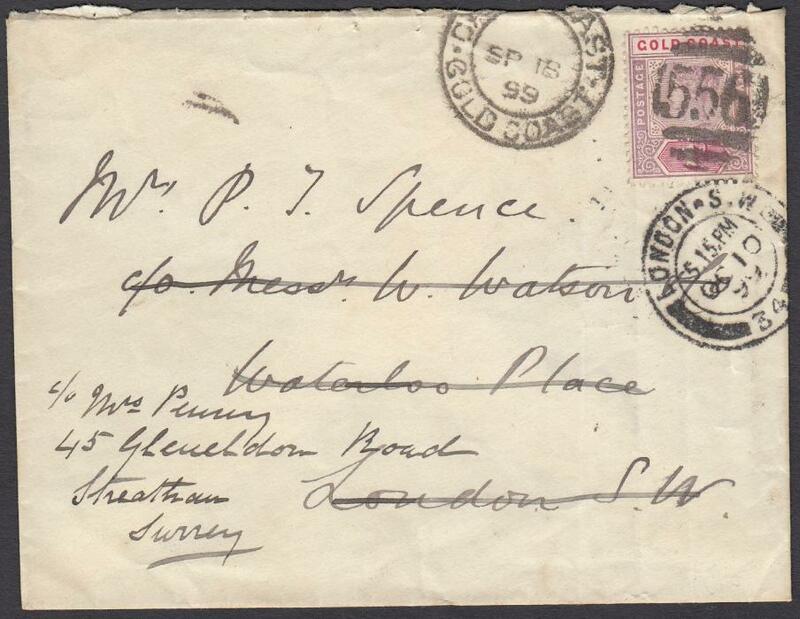 1899 (SP 18) cover to London bearing single franking 1d tied '556' CAPE COAST duplex, forwarded on arrival with forwarder's handstamp on reverse. 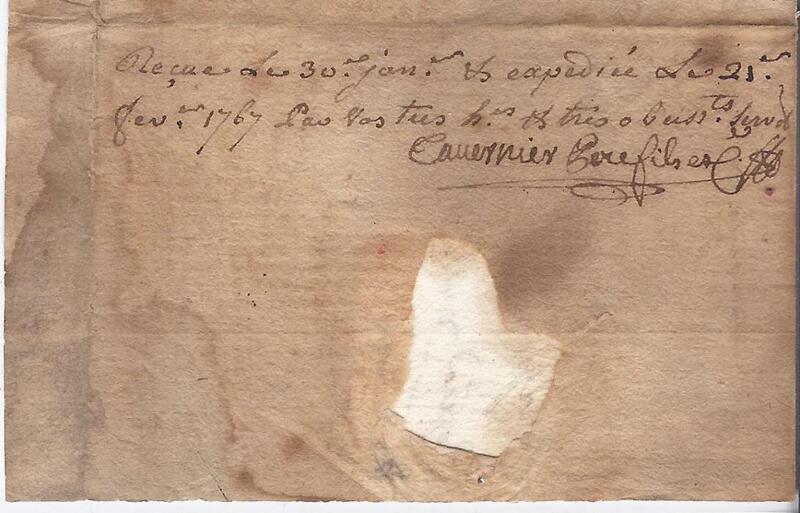 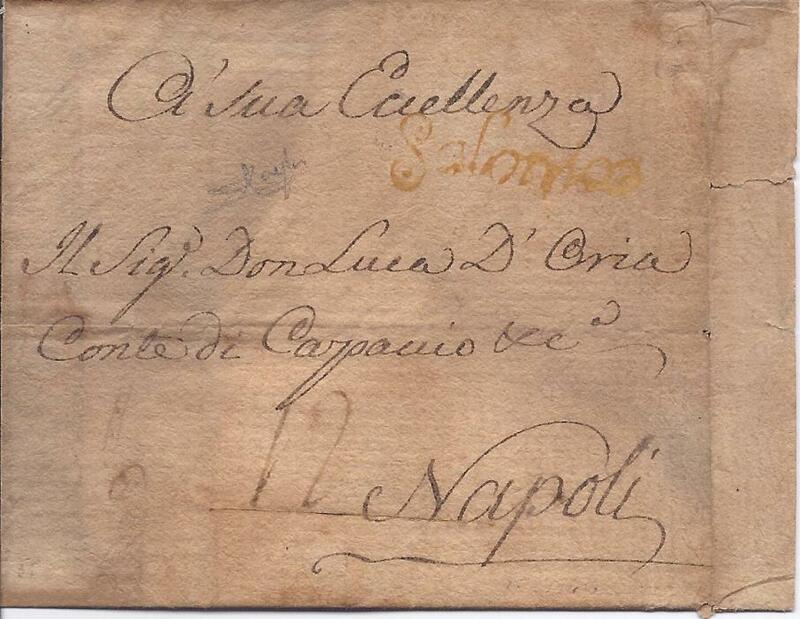 Greece 1767 folded entire from Smyrne, forwarded at Salonique by "Tavernier" (recorded by Rowe in 1767 only), held for three weeks and then sent to Naples where disinfected, a yellow cursive 'Salonico' applied in transit at Rome by the Neapolitan post Office; a rare item. 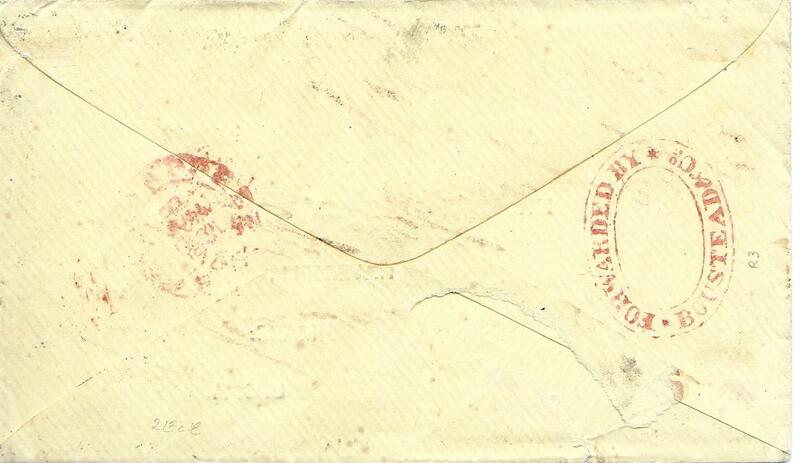 India used in Singapore: 1860s printed envelope to Haverhill, Mass., USA bearing four colour franking tied by a little unclear 'B/172' cancels, red London transit below, '5 N.York Am Pkt date stamp and cursive '16 cents' accountancy,the reverse bearing good example of double oval 'FORWARDED BY BOUSTEAD & Co.' and Singapore date stamp;tiny piece of backflap missing, fine and rare. 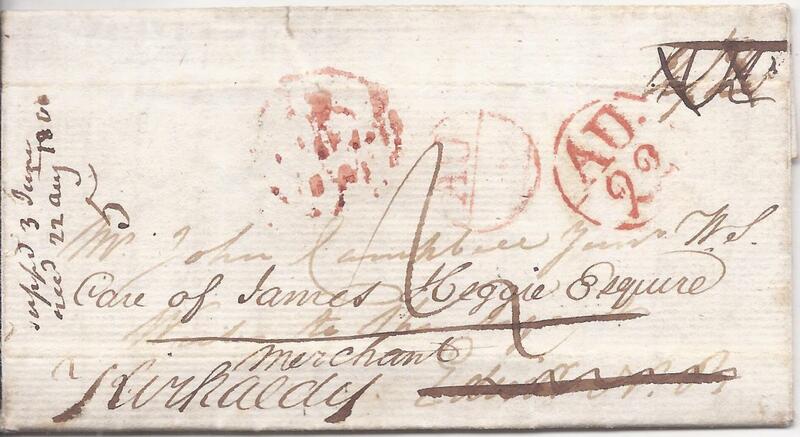 Nova Scotia 1804 entire to London bearing on reverse two-line Halifax date stamp, on arrival forwarded with manuscript "Care of James Heggie Esquire/ Merchant Kircaldy" and showing appropriate red cancels.